What makes a great pumpkin beer? Like anything subjective, it depends on personal taste. For me, a great pumpkin beer packs a strong pumpkin flavor, a nice blend of spices (not too heavy on the cinnamon) and it smells like pumpkin. It can be a dessert beer, or one that can be downed in multiples. The past two months, I tried every pumpkin beer I could find. (Check out these links to see the entire search: Part I: https://kovakscorner.wordpress.com/2014/09/05/search-for-the-perfect-pumpkin-beer/ .. Part II: https://kovakscorner.wordpress.com/2014/10/05/search-for-the-perfect-pumpkin-beer-part-2/ … Part III: https://kovakscorner.wordpress.com/2014/11/04/search-for-the-perfect-pumpkin-beer-part-iii/). There were some bad ones. (https://kovakscorner.wordpress.com/2014/11/11/steer-clear-of-these-five-pumpkin-beers/). And, finally, some were outstanding. Without any further delay, here are my top five pumpkin beers. This beer lives up to it;s name. Well done, Elysian. Well done. The aroma wafts of pumpkin pie fresh from the oven. It’s on the sweet side, so keep that in mind, but the pumpkin seeds, nutmeg and other ingredients make a wonderful blend. My original favorite pumpkin beer. I’ll always have a soft spot for Pumpkinhead. The smell and taste are intense. It’s no longer my favorite, but every taste reminds me of what attracted my taste buds to pumpkin beer nearly a decade ago. Shipyard Smashed Pumpkin is one of the best presents I’ve ever received. 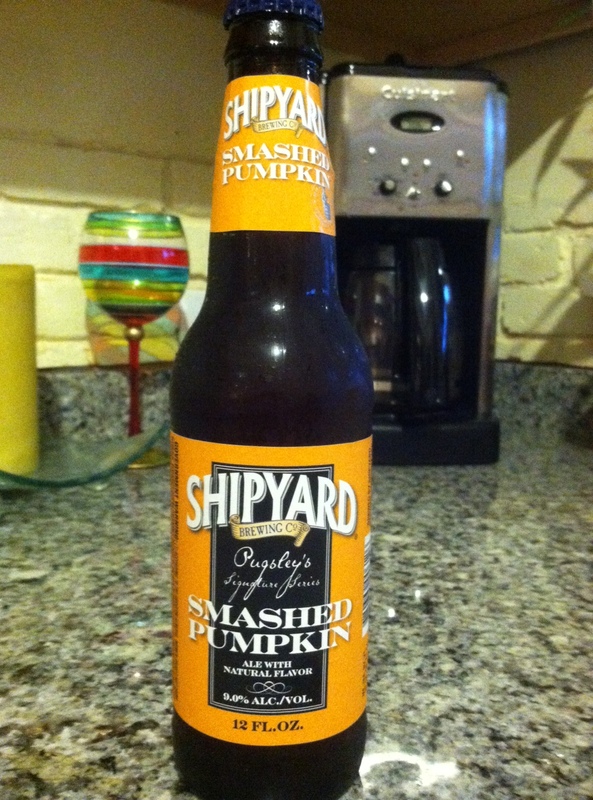 Shipyard outdid Pumpkinhead with this pumpkin pie in a bottle. The smell … it kept taking me back to a crowded pumpkin patch brimming with pumpkins. Not overdone. Balanced. Delicious. Clear yet creamy, Pumking is brimming with flavor. It’s got a kick, a little sweet, a little spicy. A whole lotta awesome. Elysian Night Owl’s flavor will have you howling, not hooting. Loaded with pumpkin flavor. Loaded with space. Tart. Hoppy. Oh hell, I’ll shut up. Go enjoy this king of pumpkin ales. Pumpkinfest, Terrapin Beer Company; Imperial Pumpkin Ale, Weyerbacher; Block House Brewing Pumpkin Ale, Pittsburgh Brewing Company; Jack-O Shandy, Traveler. 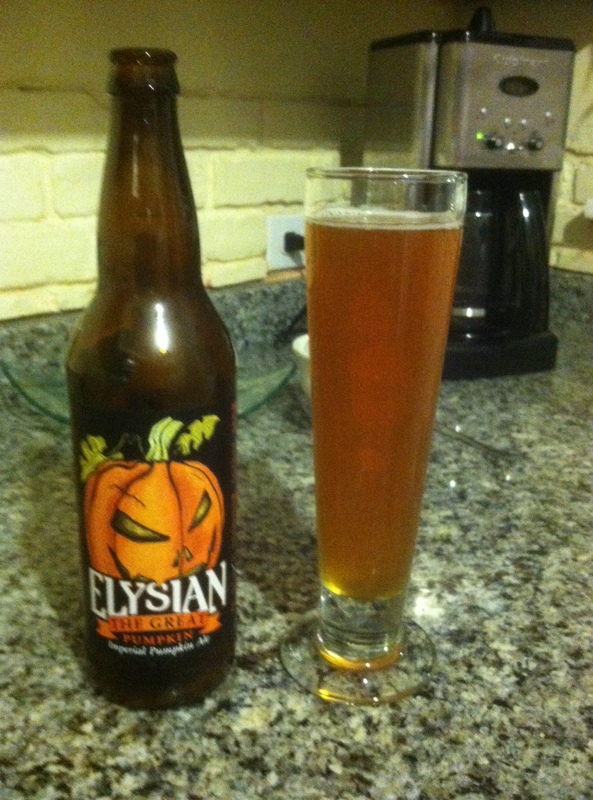 This entry was posted in Beer, Drinking, Reviews and tagged Elysian Night Owl, Pumpkin Ale, Pumpkin beer, Search for the perfect pumpkin beer, Shiipyard Smashed Pumpkin, The Great Pumpkin on November 11, 2014 by mikekovak. Beer critic? Prefer leaving that to the pseudo intellectuals who feel better about themselves by using fancy adjectives to describe beer. Those people should switch to wine. That’s where they’ll find others to indulge the need to flex an extensive alcohol vocabulary. Guess what I’m getting at is it doesn’t take cuffed skinny jeans, a PhD in barley and hops or expert taste buds to enjoy pumpkin beer. This beer lover has enjoyed a pumpkin ale for some time, but became overwhelmed in recent years when fall beers were released and a rapidly increasing number of pumpkin selections hit distributors, taverns and six-pack shacks. This search, which began in earnest in early September, held a simple objective – to find the best pumpkin beers available. No Google searches needed. No beer web sites researched. 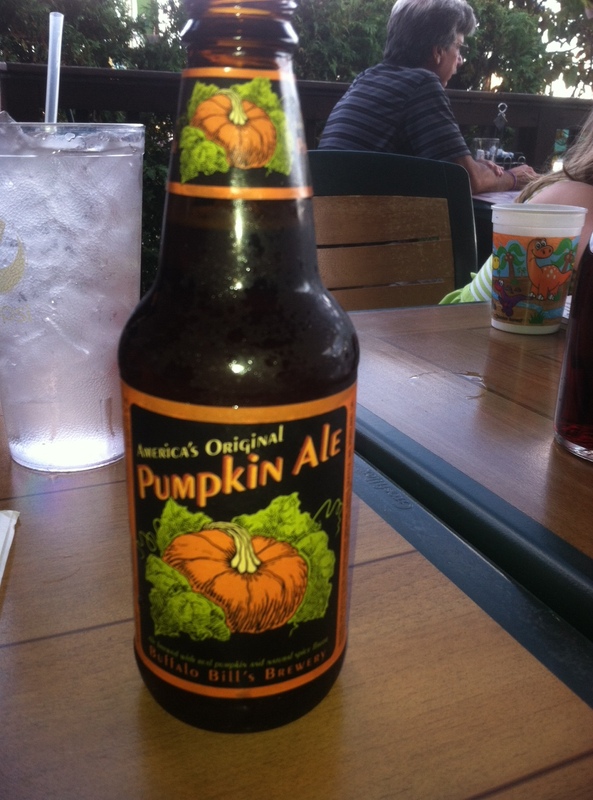 Basically, if a pumpkin beer was available at a bar or a six-pack shack, it was purchased. Suggestions were taken from friends and family, and one cousin went as far as sending a six pack of her two favorites my way. Photos were taken of each entrant and a brief description was provided of all 28 beers sampled. Unfortunately, such a search is not without its bumps. In other words, to find the good, you have to taste the bad. It’s Saranac. What else can you say? Watery, bland and lacking aroma. Saranac usually delivers an adequate brew. They missed one this one. Never had a good beer from this brewery. This gives O’Fallon’s a run for its money. This beer had all the makings of a good one, but the taste was off. Maybe Nakama had a bad keg. Word is this beer is probably with the masses. Pop country is popular with the masses, too. That is one of the only things worse than this beer. This beer was a bummer. There’s a new definition of bland in the dictionary – this beer. Never tried a gluten free beer until sampling this. I prefer my gluten. No beer in this search tasted worse on first drink. It got better, but not enough. This entry was posted in Beer, Drinking, Reviews and tagged Pumpkin Ale, Pumpkin beer, Saranac Pumpkin Ale, Search for the perfect pumpkin beer, Spooky Tooth Imperial Pumpkin Ale, The Fear Imperial Pumpkin Ale, Wild Boar Pumpkin Ale, Wolaver's Pumpkin Ale on November 11, 2014 by mikekovak. Eleven pumpkin beers were sampled in the first installment. To revisit those, click here https://kovakscorner.wordpress.com/2014/09/05/search-for-the-perfect-pumpkin-beer/. Eight more were subjected to taste testing in a second installment. Check that out here https://kovakscorner.wordpress.com/2014/09/05/search-for-the-perfect-pumpkin-beer/. Finally, Kovak’s Corner noble work in the search for the perfect pumpkin beer hits its third edition. After this, it will be time to rank the five best and five worst. I’m doing this for the readers. You’re welcome. This beer, not Derek Jeter, is the best thing to come out of Kalamazoo, Mich.
Acadia Ales Jaw-Jacker, Acadia Brewing Company – When I pour a pumpkin beer into a pilsner, I want it to look like Jaw-Jacker. A cloudy, reddish-brown, Jaw-Jacker has a slight transparency and the perfect hue. 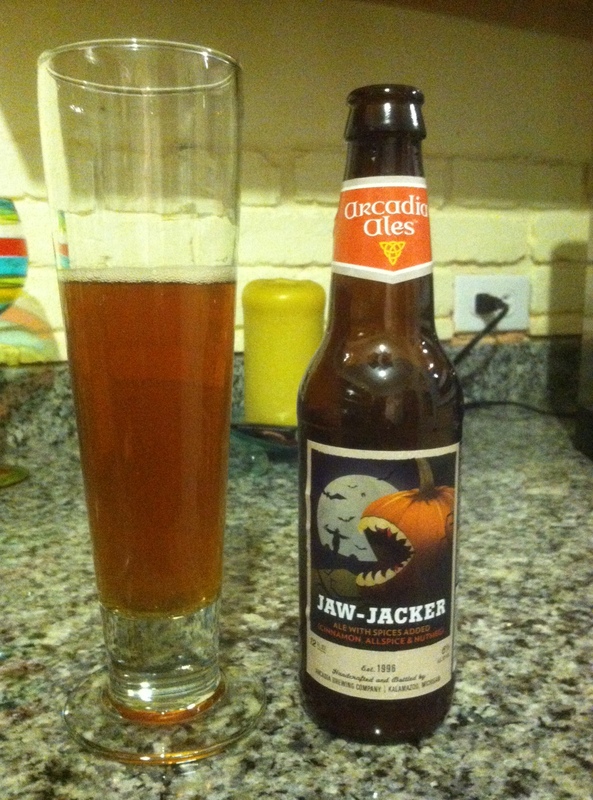 When I smell a pumpkin beer, I want it to smell like Jaw-Jacker, which boasts a blend of cinnamon, allspice and nutmeg. When I taste a pumpkin beer, I want it to taste like Jaw-Jacker, a cinnamon power punch to the taste buds. It literally make the jaw tingle, hence the appropriate name. 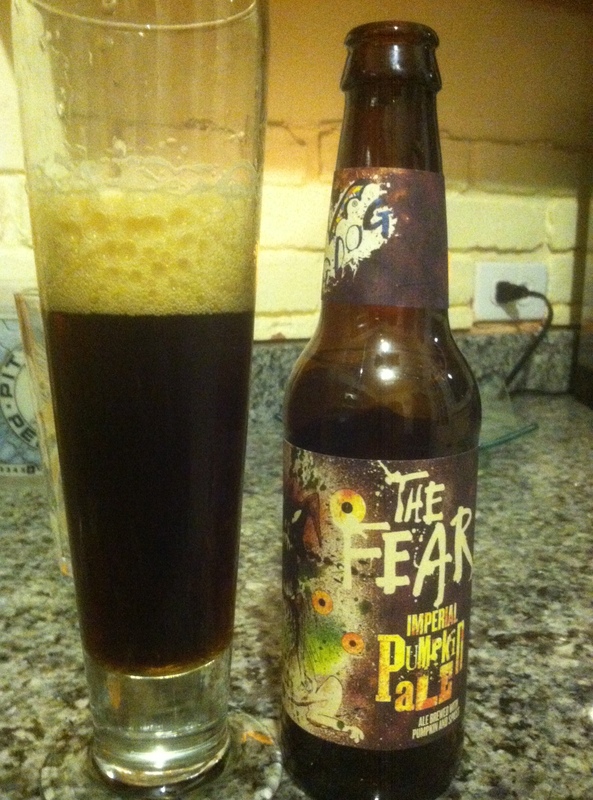 The Fear Imperial Pumpkin Ale, Flying Dog – Not sure why I picked this selection up at Johnny L’s, home of Westmoreland County’s favorite fish sandwich. I’ve never tried a Flying Dog beer I’ve liked. But the weather is cooler, making dark beer more appealing. Except this wasn’t appealing at all. Bitter. Bitter. Not good at all. And did I say bitter. Anyone that says this beer is good must be into Limp Bizkit, as that’s the crowd this brewery must want to attract with it’s “catchy” beer names and bottle art. Technically not a pumpkin beer, this cider still delivered. 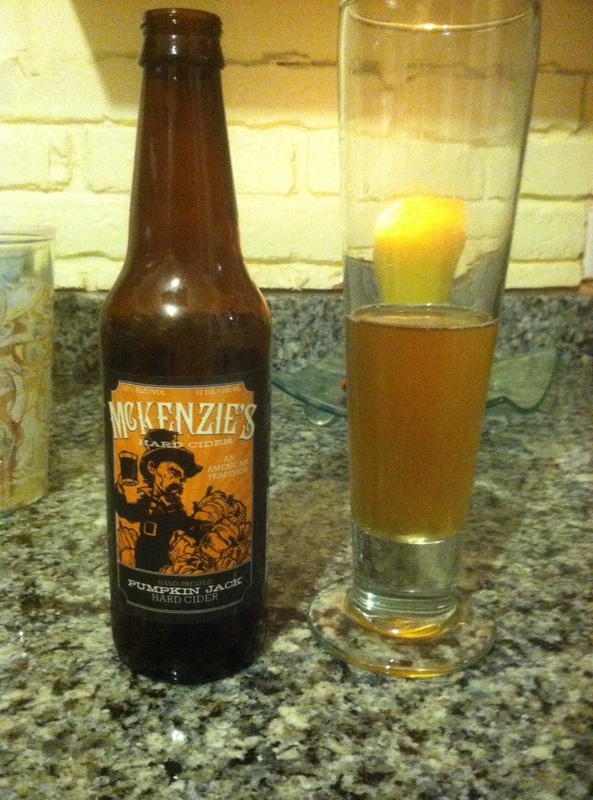 Pumpkin Jack Hard Cider, McKenzie’s Hard Cider – OK. I understand. Cider is not beer. Whatever. This beverage was recommended by a co-worker and diehard cider fan. Upon finding a bottle, I grabbed it. And McKenzie’s delivered. Couldn’t stop smelling the blissful combination of pumpkin and apple, like two heavyweight dessert pies rolled into one incredible drink. The taste wasn’t as intense as the smell, but still good. I’m a sucker for a big, orange bottle of beer. 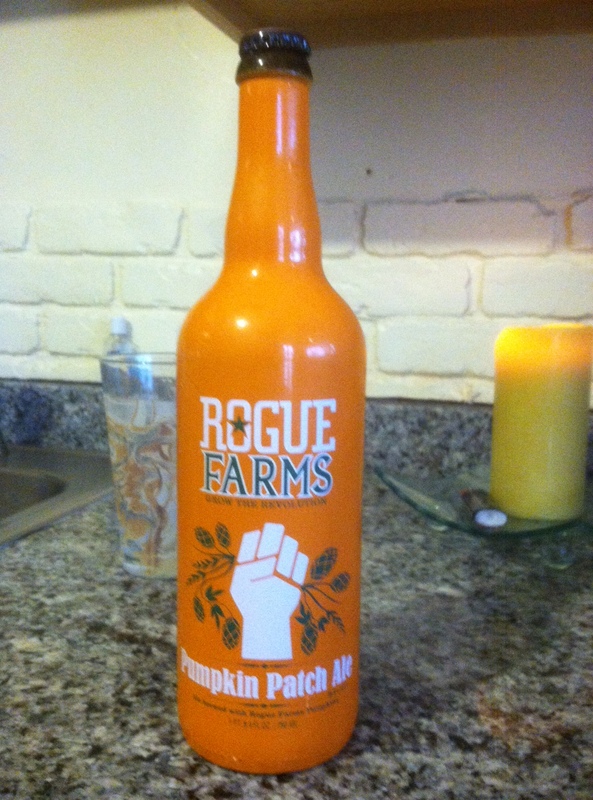 Pumpkin Patch Ale, Rogue Farms – The name’s appropriate. 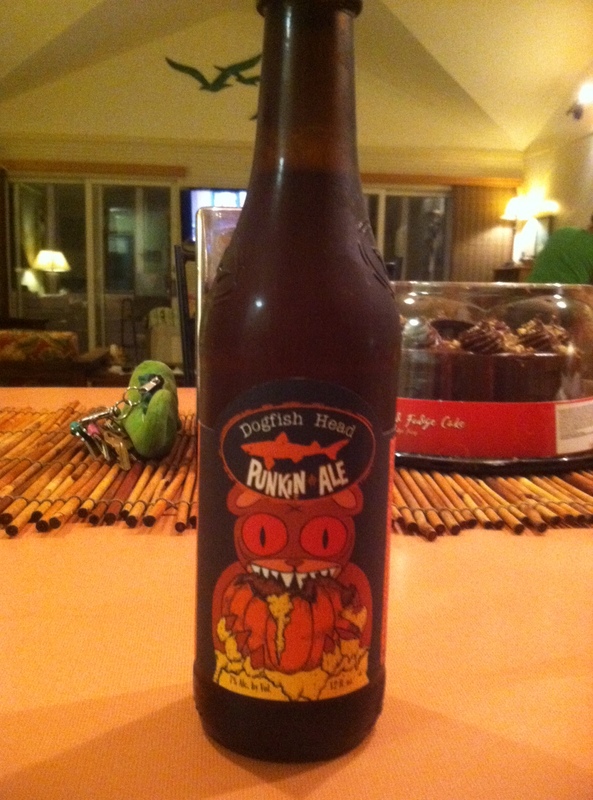 This ale smells like a pumpkin patch when it’s getting close to Halloween and the patch is overrun by families. It’s a good thing and one of the more unique beverages my nose has sniffed. There’s nice hints of orange, vanilla, hops, cinnamon and nutmeg, among others. The hue is a nice reddish brown. It’s an outstanding selection. Part of a Blue Moon sampler pack. Blue Moon Pumpkin Ale, Coors Brewing – Had to do it. Tried to avoid it. Yet, when looking for some friend-friendly beers for a weekend gathering, Blue Moon’s seasonal sampler pack was a safe purchase, and, of course, it included Harvest Pumpkin Ale. Originally, I wanted to avoid adding Blue Moon to this search. The reason? Blue Moon is safe. It’s never bad. It’s rarely top-shelf. It’s like Chipotle. 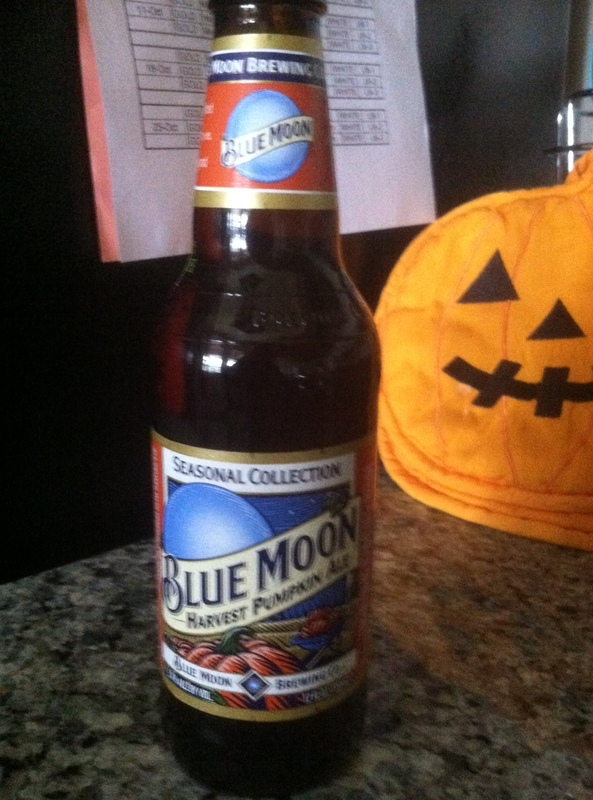 The ale has a decent pumpkin flavor, decent smell and the background of Blue Moon. Exactly what one would expect from Blue Moon. Blue Point Pumpkin Ale might have the dullest label in beer history. 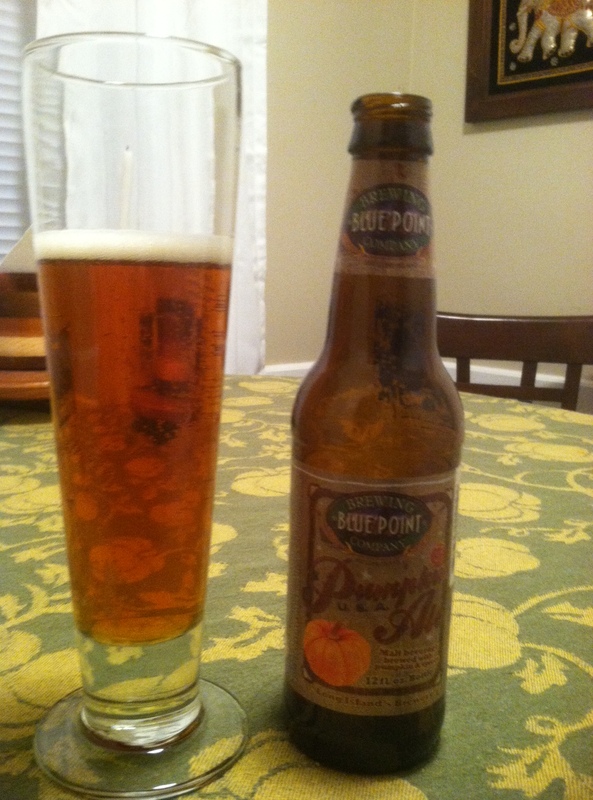 Pumpkin Ale, Blue Point Brewing Company – The first thing done when trying a new pumpkin beverage? The smell test. As for Blue Point’s pumpkin ale, there’s not much there. The aroma isn’t subtle, it’s faint. Fortunately, the taste is better than the aroma. The pumpkin flavor is faint, but subtle can be good in this genre of overpowering flavor. It tastes a little like pumpkin and a lot like ale. As for Blue Point’s ale, it;s not too shabby. A rare and different brew Terrapin Pumpkinfest (Terrapin Station nod deliberate). Pumpkinfest, Terrapin Beer Company – The idea is sheer genius. Combine a pumpkin beer with an Octoberfest beer. 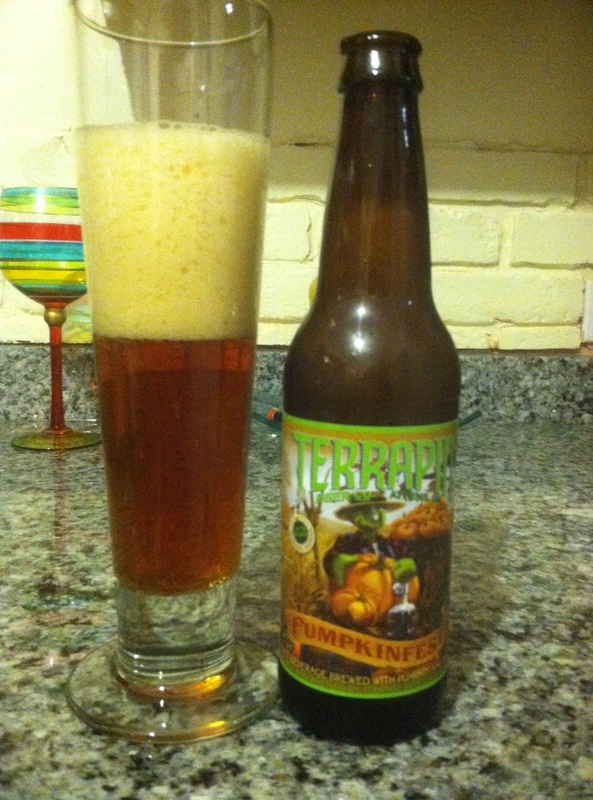 That’s what Terrapin Beer Company did with Pumpkinfest, a stunning combination of deliciousness. It owns a honey tint, a good amount of carbonation and the aroma of pumpkin, though spices are faint. The initial taste is pumpkin before the spice and malt kick in. This is an excellent choice. The Great Pumpkin, Elysian Brewing Company – Considering this comes from the maker of Night Owl, and that it claims to be the first legit pumpkin ale, expect nothing but greatness. This award-winner delivers on all fronts – color, texture, aroma and taste. It smells like pumpkin pie. It tastes like pumpkin pie. It’s a wonderful dessert beer. Saranac Pumpkin Ale, Matt Brewing Company – Saranac is sturdy, like an aunt that always comes through with a decent, but never great, Christmas gift. Occasionally, Saranac can surprise. Rarely does it disappoint. This ale falls into the latter. The aroma, watery. The taste, watery with a hint of pumpkin and cinnamon. It claims to be spiced with ginger. These taste buds had a difficult time detecting it. This entry was posted in Beer, Drinking and tagged Acadia Ales Jaw-Jacker, Beer, Blue Moon Harvest Pumpkin Ale., Blue Point Pumpkin Ale, Cider, Drinking, Flying Dog The Fear, McKenzie's Pumpkin Jack Hard Cider, Pumpkin Ale, Pumpkin beer, Rogue Farms Pumpkin Patch Ale, Saranac Pumpkin Ale, Terrapin Beer Company, Terrapin Pumpkinfesr, The Great Pumpkin on November 4, 2014 by mikekovak. Here at Kovak’s Corner, a primary concern is evolving humankind, which is why the search for the perfect pumpkin beer is an ongoing quest. It’s proven a daunting task, one which has grown larger than expected. This is why it’s being broken up into at least two parts. To check out the first search, click https://kovakscorner.wordpress.com/2014/09/05/search-for-the-perfect-pumpkin-beer/. It was originally posted Sept. 5 and randomly added to as beers were sampled. Eleven beers are featured. America’s Original Pumpkin Ale, Buffalo Bill’s Brewery – Came across this ale at my favorite Greensburg eatery – Parkwood Inn – and sampled it on the deck while partaking in a plate of hot sausage tortellini. 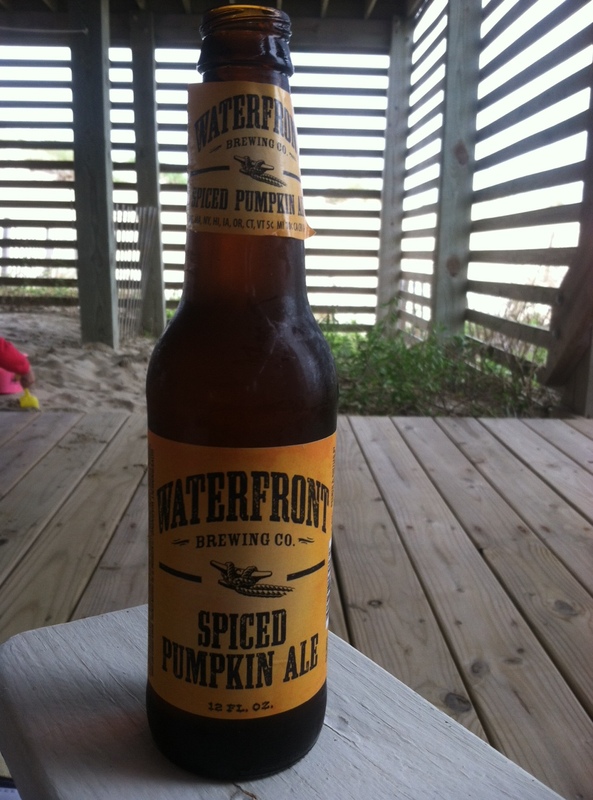 It’s certainly solid – decent pumpkin flavor, nice mix of spices. It claims to be the original. The OG of pumpkin beers. 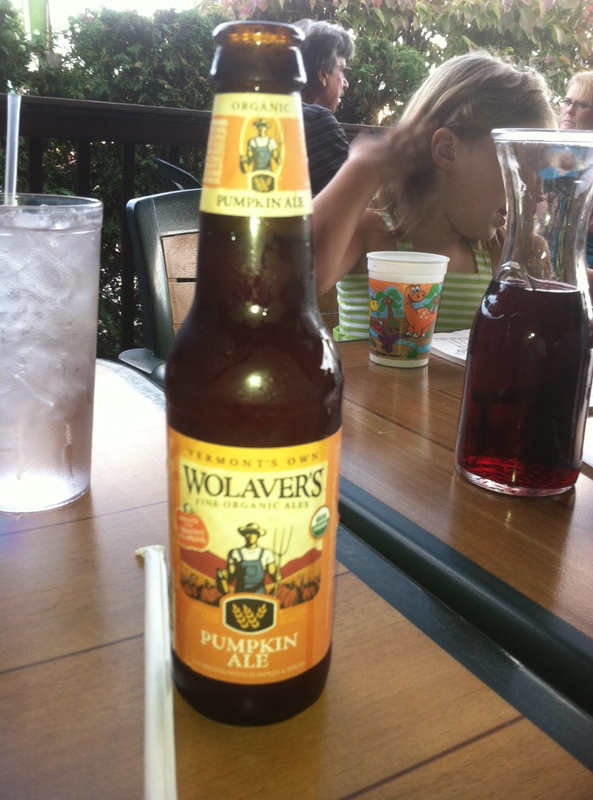 Pumpkin Ale, Wolaver’s – Another Parkwood purchase, this beer presented a first for me – gluten free. Full disclosure, the first taste sucked but subsequent drinks proved better. So, this beer grew on me. It’s made with Vermont pumpkins (the company hails from Vermont) , but the guess here is I won’t be supporting the Vermont economy again. 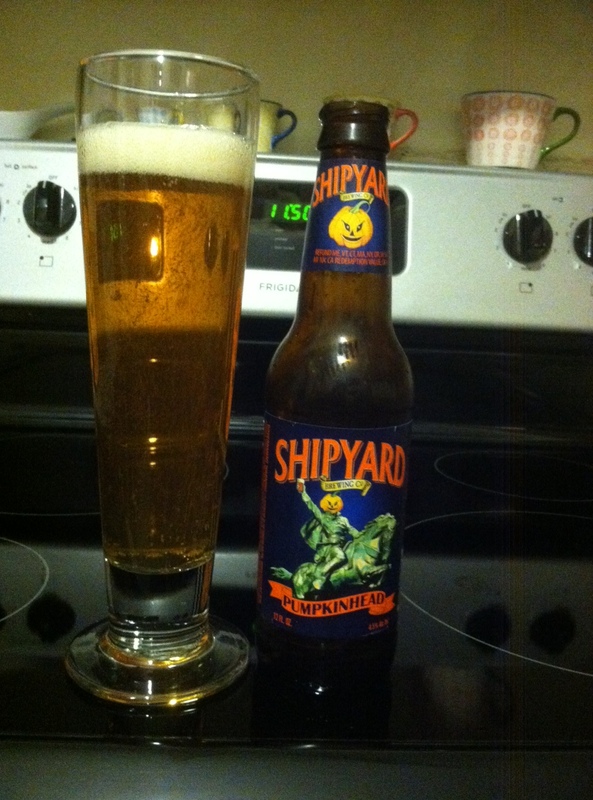 Smashed Pumpkin, Shipyard Brewing Company – Before embarking on this search, Shipyard’s Pumpkinhead ranked as my favorite in the genre, and it may still be, but I’m holding off on revisiting that selection until the end of this search. As for Smashed Pumpkin, it was referred to me by a relative, who happens to be a highly decorated person of the law. The relative went as far as sending three of these, along with three of the next beer on this list. Smashed Pumpkin is a definite contender. Bursting with pumpkin and cinnamon flavor, every sip is a calming and soothing mouthful of greatness. Oh, and it’s 9 percent alcohol, so it packs a little kick. Well done Shipyard, well done. 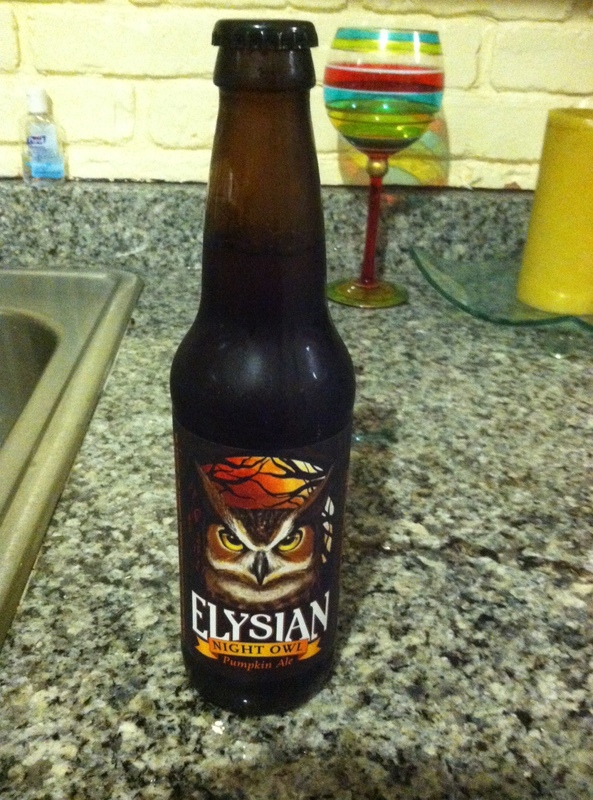 Night Owl Pumpkin Ale, Elysian – Another gifted pumpkin beer, the spices and pumpkin flavor perfectly complement the dark color and incredible texture. The beer doesn’t smell as pleasnt as others, but the taste makes it a legitimate contender. Brewed in Seattle, Night Owl has seven pounds of pumpkin and pumpkin seeds per barrel. Blended with spices, including ever-important all spice, it’s close to perfection. Pumpkinhead, Shipyard Brewing Co. – The distinct bottle, with the Headless Horseman adorning a jack o’lantern and hoisting a beer, is eye-catching, and led to a purchase several years ago. The taste, just the right blend of cinnamon and pumpkin, continues to bring me back. Full disclosure: This ranked as my favorite long before this search. It may still be. Tough to beat. Another positive, rather than brag about everything Shipyard puts into this special brew “natural flavors” is all it provides. 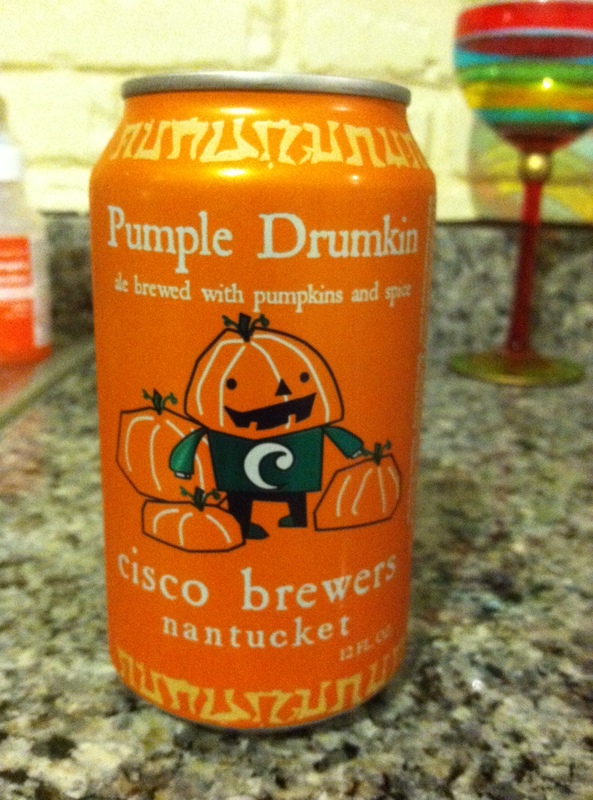 Pumple Drumkin, cisco brewers – There once was a pumpkin beer from Nantucket … Ok, ok, let’s not go there. But Nantucket is where this canned selection hails and, well, I just couldn’t resist. The main reason? I’m an unabashed supporter of “Wings” – the great 1990s NBC comedy starring Tim Daly and Steven Weber. I’ve been told on more than one occasion I resemble Brian Hackett, the happy-go-lucky pilot played by Weber. I’ve been called a lot worse. As for the beer, it’s a bit hoppy. Not that hops are bad, but it’s tough tasting the pumpkin. Overall, a very good beer. Buy this beer and read the rhyme on the can. Spooky Tooth Imperial Pumpkin Ale, Fat Head’s – Brewed in Ohio, I picked up this dark version of the seasonal treat at Nakama, a sushi/hibachi joint on Pittsburgh’s South Side. Figuring the beer had ties to my favorite sandwich place in Pittsburgh – Nakama’s Carson Street neighbor, Fat Head’s Saloon – and the place of the city’s second-best french fries (The O still rules this genre), it seemed logical to give it a try. The friendly bartender rimmed the glass in cinnamon and sugar (not my favorite thing), which really gave this beer a strong cinnamon smell. As far as aroma goes, Sppoky Tooth is wonderful. It’s texture is rich and dark. The spices, from nutmeg to clove are evident. It has all the ingredients for a perfect pumpkin beer, but something was missing – namely a good taste. Maybe it was the rimmed glass, but this beer was a bummer. Imperial Pumpkin Ale, Weyerbacher – Brewed in Easton, home of former heavyweight boxing champion Larry Holmes, this pumpkin ale packs a punch. Maybe it’s the cardamom, which is a subplot to a fantastic episode of Cheers. It’s the bloody mary contest, and Cheers gets ahold of cardamom until Woody sneezes it away because of an allergy. Back to point, this darker outing boasts a wonderful blend of spices and just the right amount of pumpkin flavor. Like a piece of pumpkin pie. 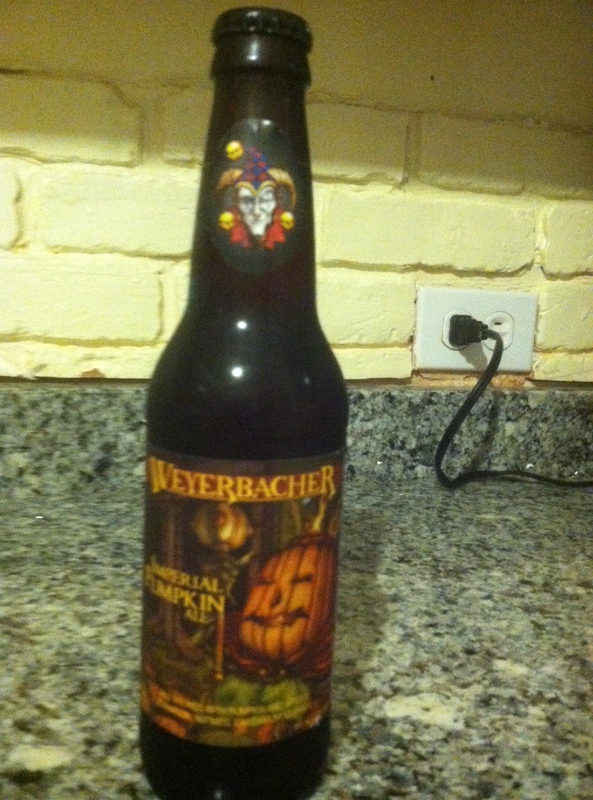 Heavy on spices and darker than the average pumpkin ale, Weyerbacher found a winning formula. This entry was posted in Beer, Drinking and tagged Buffalo Bill's Original Pumpkin Ale, Elysian Night Owl, Fat Head's, gluten free beer, Greensburg, Nakama, Parkwood Inn, Pumpkin Ale, Pumpkin beer, pumpkin flavor, Shiipyard Smashed Pumpkin, Shipyard Brewing Company, Spooky Tooth, Weyerbacher Imperial Pumpkin Ale, Wolaver's Pumpkin Ale on October 5, 2014 by mikekovak. The leaves are starting to change colors here in Western Pennsylvania. High school football is under way. So is college and pro football. All tell-tale signs of fall, probably the greatest of all seasons. What’s best about fall? It’s a tough call. There’s the crackling of leaves underfoot and smell in the air on a walk/hike. Gotta love Halloween. And you better lover pumpkin beer. Yep, it’s all pumpkin, all the time. Pumpkin gobs, pumpkin donuts, pumpkin bread, pumpkin coffee and pumpkin-scented candles. 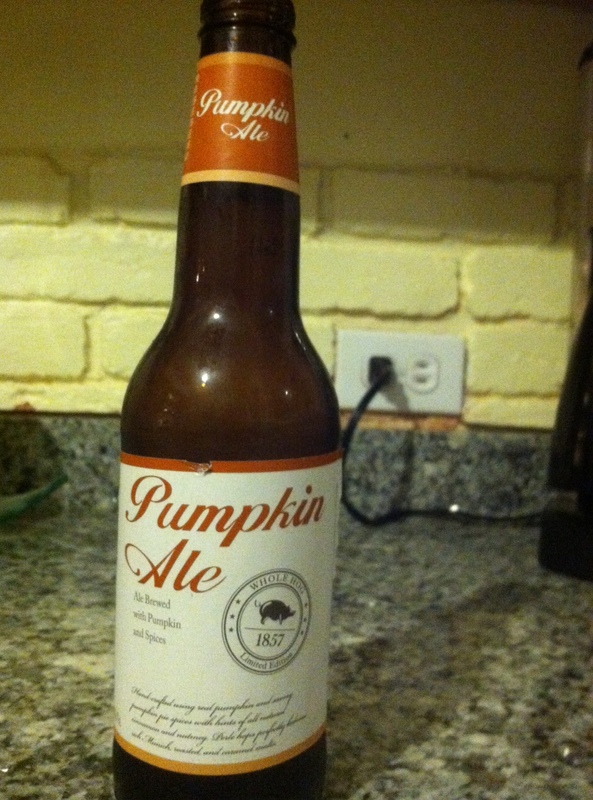 But nothing quite beats the refreshing, crisp taste of a pumpkin beer on a fall evening. And it’s time to find the perfect pumpkin beer. I’ve sampled many over the years, but never documented it. And, to date, the only one I’ve found unsatisfactory is O’Fallon’s. Join me in the search. The following will be an evolving and expanding list. Please, offer your suggestions and recommendations. Hopefully, through lots of research and sampling, we’ll find the perfect pumpkin beer. Samuel Adams, Harvest Pumpkin Ale – This is the first pumpkin brew I’ve tried this season, and I came away quite pleased. The taste of pumpkin was evident from the first drink, and it offered a texture similar to an iced coffee, which I found relaxing. A touch of caramel added depth. 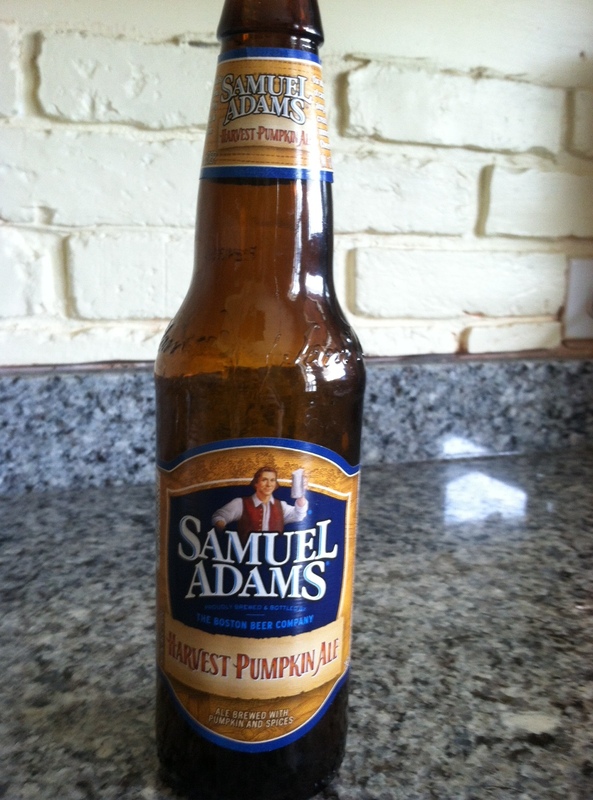 The first beer sampled in the search for the perfect pumpkin beer was Sam Adams’ Harvest Pumpkin Ale. 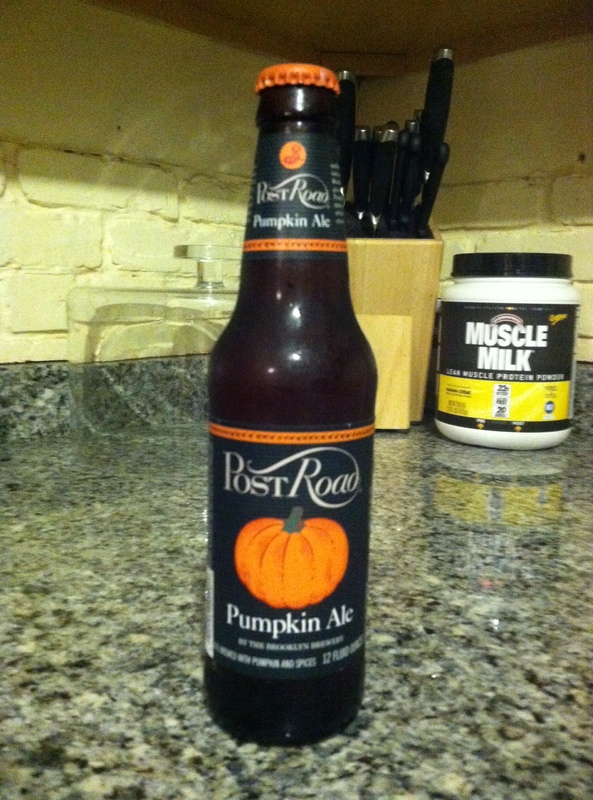 Post Road, Brooklyn Brewery – This pumpkin ale carries a hoppy taste, hoppier than any pumpkin beer that I can recall. Yet, the spices are evident from the first sip and the aftertaste is smooth as a baby’s bottom. The other knock – the pumpkin flavor is difficult to differentiate. Post Road from Brooklyn Brewery has the hops and one smooth aftertaste. Country Pumpkin, Ithaca – The first taste of this little-known pumpkin brew (at least in my world) was nice and crisp. The crispness remained and a nice pumpkin flavor followed with every taste. A knockout pumpkin brew. Ithaca’s Country Pumpkin is a worth contender in the search for the perfect pumpkin beer. 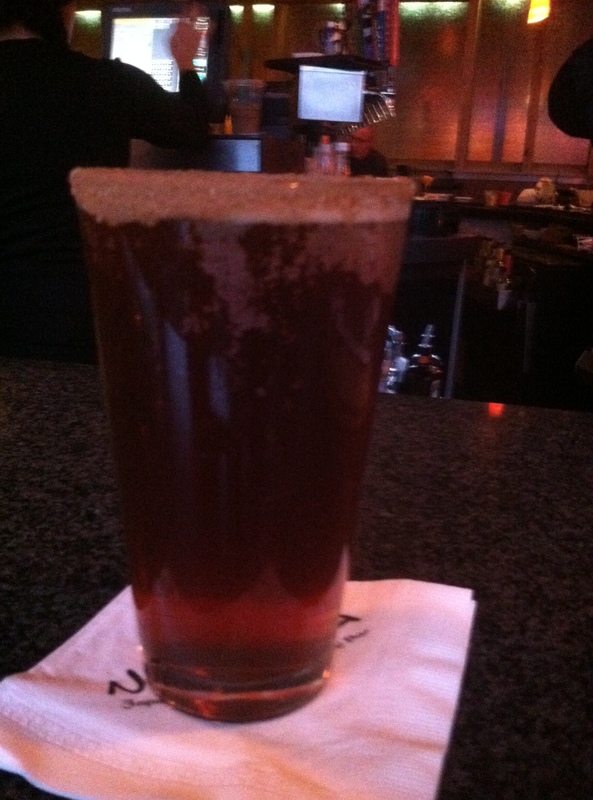 Pumpkin Roll Ale. Penn Brewery – Had this Pittsburgh-based pumpkin brew recommended from a faithful Twitter follower and find it to be an interesting entry into the fray for perfection. This won’t finish at top of the final list, but it would be a fine selection to complement a dessert. For some reason, I felt like I was drinking a Coke Zero Vanilla with every taste. Penn Brewery’s Pumpkin Roll ale would be a top-notch choice to go with a slide of apple pie, but its sweetness could be overbearing after one serving. 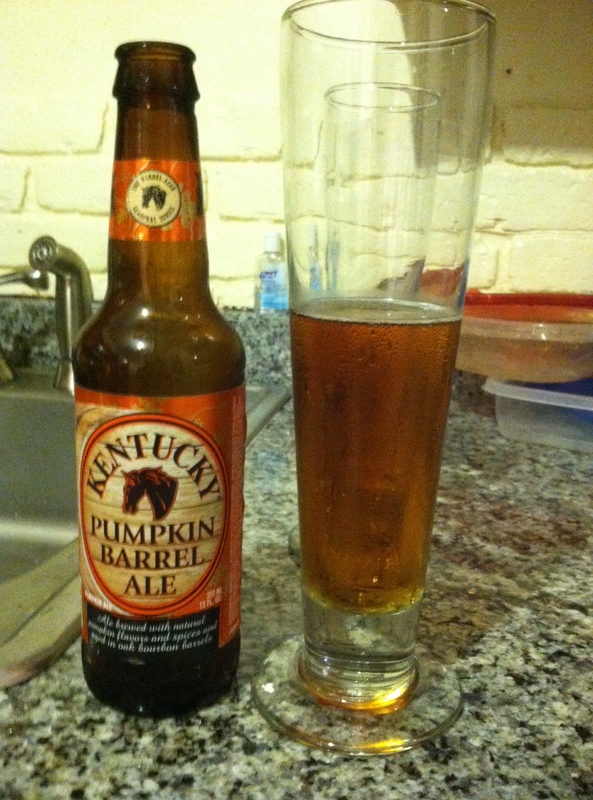 Kentucky Pumpkin Barrel Ale – Not going to lie, this was an eye-test purchase. Something about the bottle caught the imagination, which I guess qualifies this one as an impulse buy. And a good impulse buy at that. This delectable pumpkin ale is stored in an oak barrel, and that is evident. It gives it a slight whiskey quality, which combined with the pumpkin and spice is a party to the tastebuds. You can taste the oak. It’s not a bad thing. 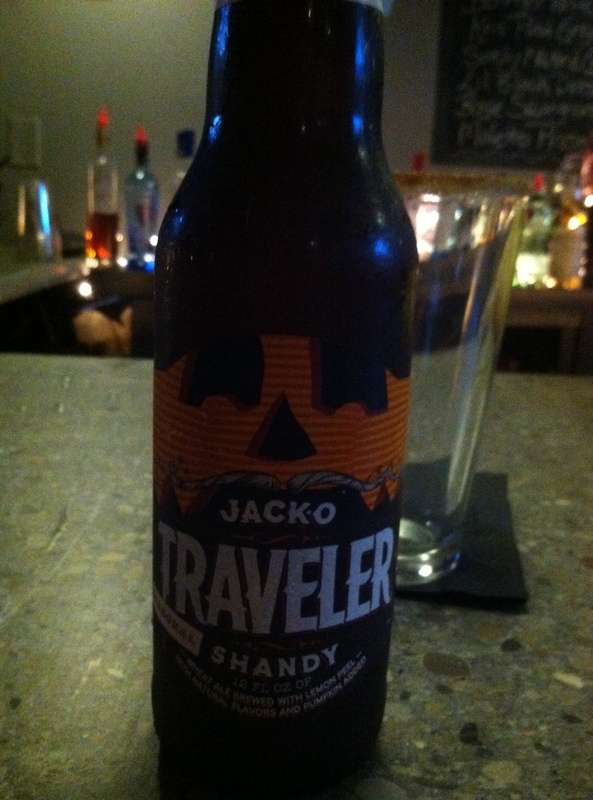 Jack-O Shandy, Traveler – The bartender in the building above the Olde Spitfire Grille offered this as a choice when I asked for a pumpkin beer and I agreed before realizing it was a shandy. A lemon taste to my pumpin beer? Part summer ale, part pumpkin ale? Regretted the decision until the taste. It was surprisingly good, refreshing and the lemon added just the right touch. Good enough that I had seconds, even with a cinnamon-sugar brim on my glass. The later, while it added a nice touch to the taste, caused some nasty day-after burps at the gym. But this surprise is a definite contender. It’s pumpkiny, it’s fruity. It’s magically delicious. Pumking, Southern Tier – This treat, purchased in a hearty 24-ounce bottle (why don’t more beers come in big bottles? I mean malt liquor companies can’t be the only ones to realize the value.) was recommended by colleagues, co-workers and friends from Twitterverse. Normally, things with build-up don’t deliver. Ummmmm, Pumking is anything but normal. The boldness of pumpkin flavor is reminiscent of something from a favorite bakery. The aftertaste is so pleasant, which means Pumking can be enjoyed in quantity unlike many brands of pumpkin ale. There’s no doubt Pumking is the leader heading down the stretch of this search. Block House Brewing Pumpkin Ale, Pittsburgh Brewing Company – A close inspection of the bottle, which was emptied into a pilsner (always a fine way to enjoy a pumpkin ale), showed it’s bottled in Latrobe, only a few miles away from my hometown. Possibly, the proximity swayed opinion to a degree, but this pumpkin ale ranks as the most pleasant surprise of this search. It rivaled the pop of pumpkin flavor packed by Pumking and left me wishing I had purchased more than one bottle. All that can be said is, if you haven’t tried this local fare, get out there and buy local. 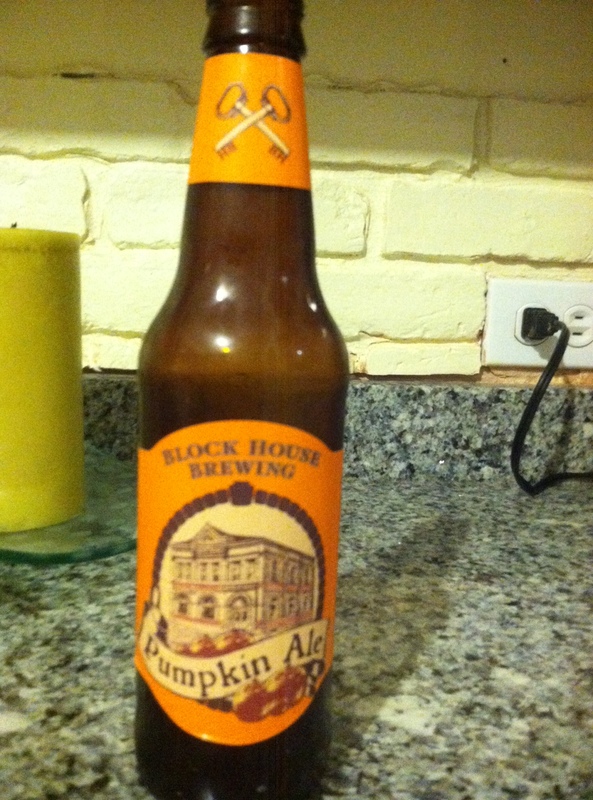 Block House Brewing Pumpkin Ale will be at or near the top of the best pumpkin beer list. Pumpkin Ale, Wild Boar – OK, lets get this out of the way first. This beer was a total bummer. Maybe it’s because it was sampled following a Pumking and Block House Brewing Pumpkin Ale. Maybe it’s because it’s bland. Punkin Ale, Dogfish Head – One of my favorite beermakers, Dogfish Head rarely disappoints and this pumpkin brew, which I’ve sampled multiple times, is no exception. The allspice gives Punkin Ale a warm, hearty taste. The brown ale gives it a heavier taste than other pumpkin offerings. It’s not the best out there, but it’s very solid and well-suited for colder fall weather. If this bottle doesn’t catch your eye, you don’t like orange, And remember fellas, women like a man who looks good wearing orange. That is a scientific fact. Spiced Pumpkin Ale, Waterfront Brewing Company – Bottled in Portland, Maine, where I was offered my first full-time sports writing job out of college (I turned it down after they called on a Friday and asked me to be there by Monday without as much as an interview), this rare find was sitting on the shelves at Food Lion in Corolla, N.C. There weren’t many six-packs purchased, with almost deterred me from selecting it. It packs good pumpkin flavor, but the odd thing is the beer is light. While not listed as a light beer, it tastes like one. At the beach, that’s not a bad thing as it lends to having more than one or two. Overall, it’s a positive experience. Something about this beer tastes better with sand as a backdrop. 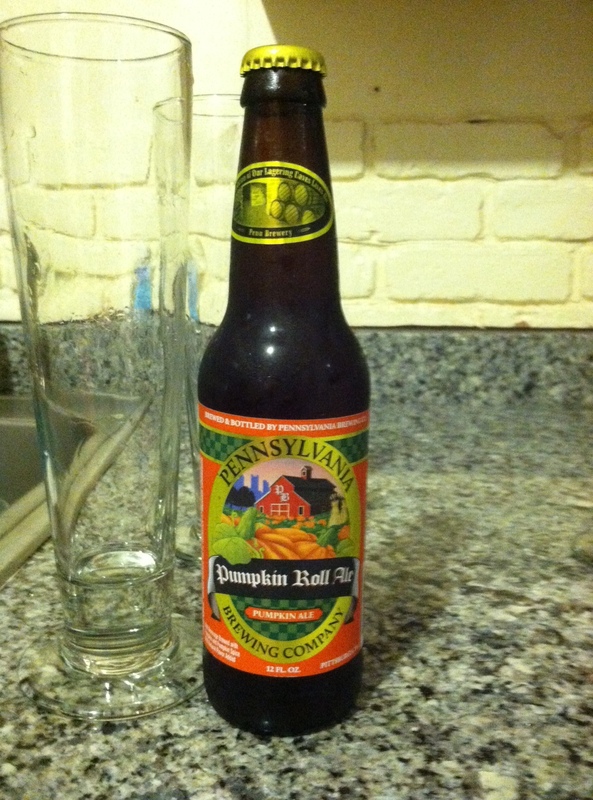 This entry was posted in Beer, Drinking and tagged Beer, Fall, Harvest Pumpkin Ale, Ithaca, Kentucky Barrel, Penn Brewery, Post Road, Pumpkin beer, Samuel Adams, Traveler on September 5, 2014 by mikekovak.